A simple Wireless sensor monitoring system - Robert Owen Inc.
Wireless sensor transmitter system, provides real time monitoring of remote sensors. PC connected, by USB port, remote measurement of sensors up to 1 mile away. Compatible software tools, turn Remote Sensor’s into Data Acquisition Systems. Software tools; turn Excel into a real time display and data acquisition program. * PC connection by USB port RF adapter allows remote sensor measurement. Useful for real time sensor trend plotting and active measurement. 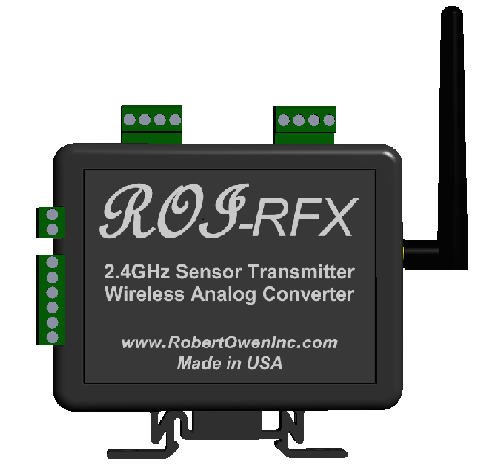 Learn more about the ROI-RFX Wireless Sensor Transmitter System.